Before “always connected” smartphones and tablets, there were PDAs. 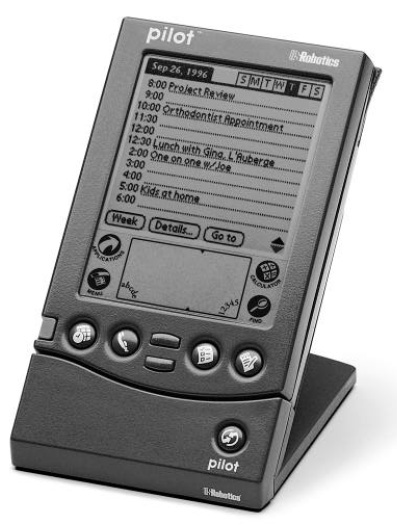 And for a long time the name synonymous with PDAs was “Palm Pilot”. 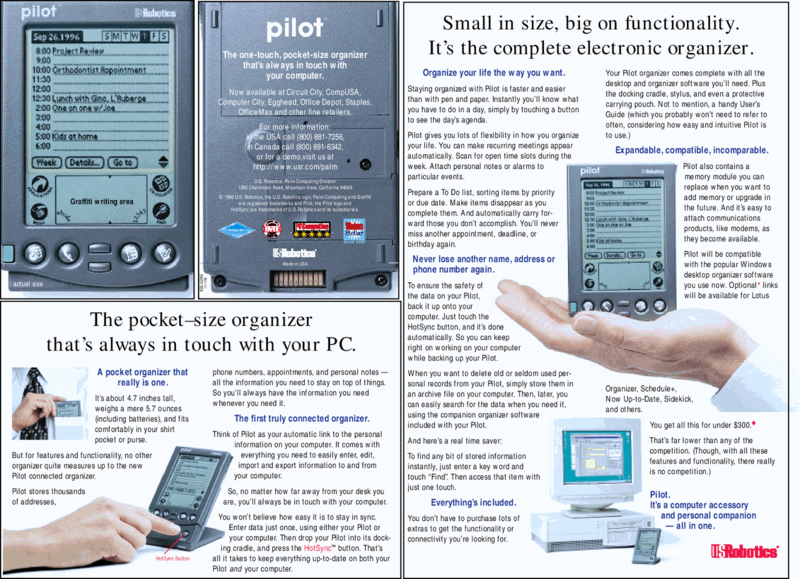 Twenty years ago this month, the first Palm Pilot devices were launched, the Pilot 1000 and Pilot 5000. With a form factor and weight that was quite similar to a modern smartphone, the Pilot was powered by two AAA batteries that could keep the device in use for weeks. It had a 160 x 160 pixel monochrome display with an area underneath for handwriting recognition (using a stylus) plus some buttons for application control. Inside was a Motorola 68328 “Dragonball” processor, with 128Kb of RAM for the Pilot 1000 and 512Kb for the 5000 versions. The only connectivity offered was a serial connection to a PC or Mac, allowing data to be synchronised between the two. The built in applications were pretty basic – a calendar, address book, to-do list and memo taker, but for 1996 that was pretty impressive in a device this small. The basic Pilot 1000 model was $299 in the US, with the 5000 coming in at $369. For a pocket computer, that was pretty good value.. but for a fraction of the price you could buy a Filofax instead, and that was almost infinitely customisable. Despite its limitations, the Pilot and it successors were a huge success in the late 1990. But rivals such as Nokia had a different vision, and devices such as the original Nokia Communicator combined PDA function with a mobile phone, although without initially gaining much success. Palm ended up owning the market, and other models followed with improved features, including the ability to sync email which could be read and replied to offline. But it took Palm a long time to understand that people wanted more than a PDA and it wasn’t until 2003 that they released their first smartphone, the PalmOne Treo 600.. and only then because they had bought a rival company called Handspring. Ultimately, Palm suffered the common fate of tech companies where it helped to define a market and then got left behind. The company’s byzantine history ended in 2011 as part of HP. Today, these original Palm Pilots are uncommon but inexpensive with prices as low as £35 / €32 / $35. Trying to USE one with a modern computer could be tricky, since you’d need an old-fashioned serial port too.. but it might just be worth it for the reaction when you pull one of these ancient devices out of your pocket!